Brigadier General Machut is currently serving as the Commanding General, 4th Marine Logistics Group, Marine Forces Reserve. Brigadier General Machut was born and raised in Chicago, Illinois. Upon receiving a Naval ROTC Scholarship, Brigadier General Machut attended Tulane University in New Orleans, graduated with a Bachelor of Science in Civil Engineering in 1982 and was commissioned a Second Lieutenant. As a company grade officer, he served with 7th Engineer Support Battalion at Camp Pendleton, as a platoon commander, Company XO and the Battalion Assistant Operations Officer. He further served aboard the USS Forrestal (CV-59), as the Marine Detachment Executive Officer / Guard Officer. Joining the Marine Corps Reserve in 1988, he served in several billets with 4th Bridge Company and Engineer Support Company, 6th Engineer Support Battalion, to include tours as the Executive Officer for each company and as the Commanding Officer for 4th Bridge Company. From 1996 to 1998, and again from 2000 to 2002, he served as the Group Engineer Officer for 4th Force Service Support Group in New Orleans. In between, from 1998 to 1999, he was assigned as the Commanding Officer, Engineer Company C, 6th Engineer Support Battalion, Peoria. In 2002, he assumed command of the 6th Engineer Support Battalion in Portland, Oregon. As a Lieutenant Colonel, Brigadier General Machut was in command of 6th Engineer Support Battalion when the entire battalion was activated in support of Operation Enduring Freedom/Operation Iraqi Freedom in 2003. He led the battalion into Iraq at the commencement of the war, providing bulk fuel and water support for IMEF forces during the campaign to Baghdad. Returning the battalion back home after 7 months, he continued to prepare companies for further deployments in support of OIF. Promoted to Colonel in 2004, he relinquished command later that year. 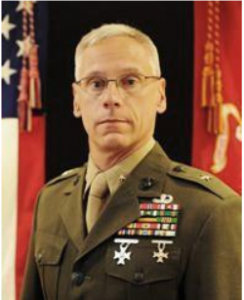 As a Colonel, Brigadier General Machut served as a Senior Assessment Officer with Marine Corps Mobilization Command, as the Commanding Officer of 4th Marine Logistics Group Forward West, as the Lead Planner for 4th Marine Logistics Group and finally as the Deputy Commander for 4th Marine Logistics Group. Promoted to his current rank in August 2010, Brigadier General Machut was assigned as the Commanding General, Marine Corps Mobilization Command in November 2010. He assumed the duties of his current assignment in September 2011. Brigadier General Machut was selected for and attended the U.S. Army War College through their Department of Distance Education. He graduated in July 2007 with a Masters in Strategic Studies. As a civilian, Brigadier General Machut is a registered Professional Engineer in the State of Illinois. Brigadier General Machut’s personal decorations include the Bronze Star, the Meritorious Service Medal with a gold star, the Navy Commendation Medal with gold star and the Navy and Marine Corps Achievement Medal.